Famous Bald Eagle Pair Mr. President & the First Lady Have Welcomed the First Egg of 2018 into Their Washington DC Nest — Just In Time For Easter!! March 25, 2018 – Bald Eagles ‘Mr. President’ and ‘The First Lady’ laid their the first egg of 2018 into their National Arboretum nest in Washington DC. They will possibly lay a second egg right before Easter weekend. 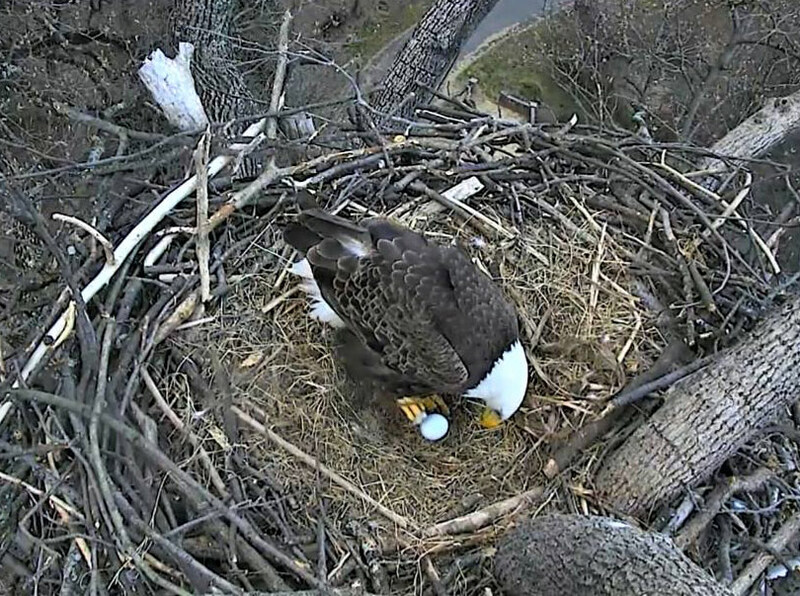 Find out by watching the DC Eagle Cam LIVE. Photo © 2018 American Eagle Foundation. 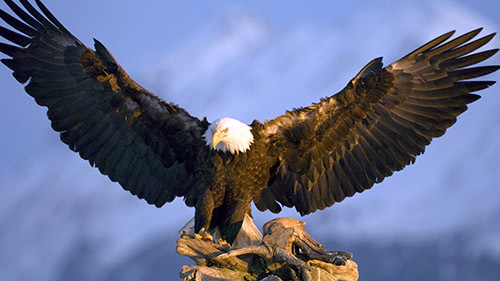 Washington, DC – During the Spring of 2016, the D.C. Eagle Cam took the world by storm, generating more than 63 million views from over 100 countries during a five-month period. Nature and animal enthusiasts intently watched this patriotic eagle pair as they raised their second and third eaglets in their Tulip Poplar nest in the U.S. National Arboretum. These eaglets were initially known as DC2 & DC3 and were later dubbed Freedom and Liberty by the public. In 2015, before the DC Eagle Cam project came to be, the pair raised one eaglet (DC1). Since the nonprofit American Eagle Foundation (AEF) and USDA re-launched the DC Eagle Cam to the general public on New Year’s Eve, viewers have been patiently watching and waiting for the pair’s next set of eggs and eaglets. Those who were watching the cams on March 25, 2018 around 4:30 p.m. EST were lucky enough to see The First Lady lay her first egg of the 2018 nesting season. For all of those who missed it, they can watch the video HERE. Viewers should make sure to watch the cams over the next several days to catch the laying of the second egg, if ‘The First Lady’ produces another (like she did last year). Eagle pairs typically produce 1-3 eggs annually (usually laid and hatched a few days apart), but because this pair raised one eaglet during their first nesting season, two eaglets their second season, and two eaglets their third season there’s no telling what to expect this time around, especially since the nest has gotten larger. For all the viewers who watched the cams last year, what happens after the egg-laying is no surprise. From this point on, the eagle pair will delicately incubate and relentlessly protect their egg(s) from rain, snow, hail, thunderstorms, and predators (like raccoons). They will also take turns with the incubation duties throughout the day to let each other take breaks and hunt/fish for food. In 2015, the American Eagle Foundation (AEF) staff traveled to D.C. to install state-of-the-art cameras, infrared lighting, and other related equipment in-and-around the nest tree with the help of experienced technicians and tree climbers, as well as AEF staff and volunteers. The USDA’s U.S. National Arboretum ran a half-mile of fiber optic cable to the cameras’ ground control station, which connects the cameras to the Internet. The entire system is powered by large mobile solar panels (containing several deep cycle batteries), which was designed and built by students and staff from Alfred State College, SUNY College of Technology and was partially funded by the Department of Energy and Environment. USNA has implemented a backup generator that will kick-on if prolonged inclement weather causes the solar array to provide insufficient power to the system. In 2016, APEX Electric Inc. (Kenmore, Washington) traveled to D.C. to assist the AEF in successfully installing audio equipment in and around the tree. The AEF uses Piksel to stream the video images to viewers around the world, and AEF volunteers are trained and coordinated to pan, tilt and zoom the two video cams, as well as educate the public via LIVE chats while viewers (including adults of all ages and school children) watch and listen to the eagles via the video cams and microphones over the Internet.